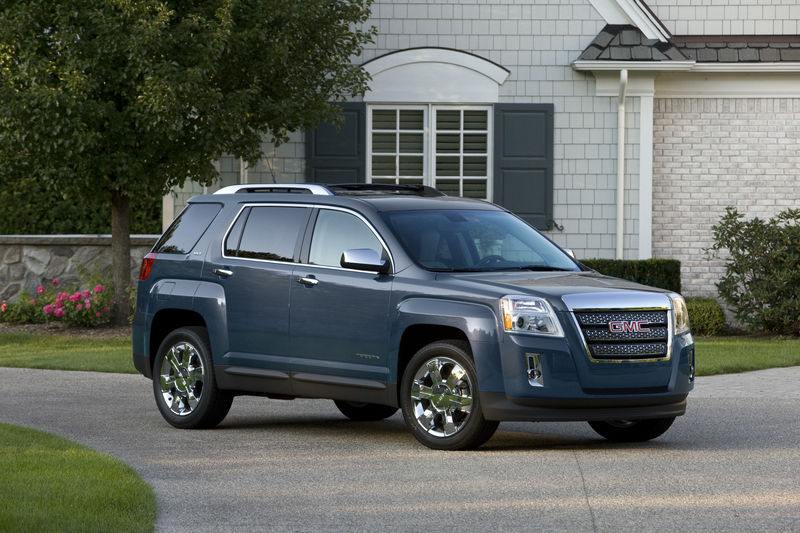 GMC’s Terrain is a cousin to Chevrolet’s Equinox, with the GMC getting the boxier styling and the Chevy having smoother lines. When I drove a GMC Terrain a couple years back I was impressed by its fit, finish and good value in the small sport-ute or crossover market. Not much has changed in a couple years and mostly that’s good. Terrain slots in above the many smaller SUVs and crossovers, but isn’t big enough to be a 7-person hauler. Yet there is ample room inside for five adults and their luggage. Plus, in its nine trim levels the GMC comes with a 182-horse 2.4-liter Ecotec 4-cylinder engine that is rated 22 mpg city and 32 mpg highway. That creates a fine economy hauler for folks who prefer a taller vehicle to a standard mid-size sedan. I tested a “quicksilver” Terrain SLT-2 with front-wheel-drive. Only the all-wheel-drive model is higher on the model’s pecking order. The tester started at $31,180 and has an $810 delivery fee. While the 4-cylinder will get the job done, many folks with big kids or who regularly haul more cargo will opt to move up to GMC’s 3.0-liter V6 that creates 264 horses and 222 pound-feet of torque. This would be the recommended engine too if you plan to tow anything and the V6 will cost you $1,500 extra. Terrain is rated at 1,500-lbs. of towing power with the I4, but with the larger engine and $350 towing package that the tester included, will tow 3,500 lbs. Both engines are hooked up to a smooth shifting 6-speed automatic. I like how this one operates. It gives the ute a more upscale feel than some small utes. Power is good too, but as with many vehicles these days, there is some acceleration lag when you need to call up some of that power, say on the highway or accelerating from a slower corner. The result is the Terrain feels heavier than it is. This tips the scales at 3,881 lbs., but you’d swear it was well over 4,000. That can be argued as a benefit, in that it feels solid and substantial, or it can make the ute seem a bit sluggish when trying to pass on the highway, unless you tromp the pedal to drop down a gear. 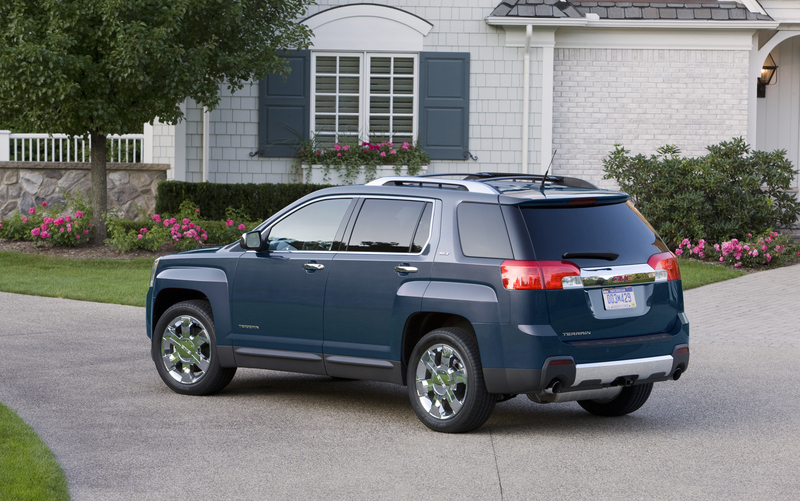 Yet the automatic’s gearing gives the Terrain good low-end power so you can pull away from stoplights with authority. Ride generally is comfortable and well controlled, even a bit firm. But it becomes choppy on sharp bumps, like frost heaves and seams in concrete pavement. Handling also is pretty decent, more carlike than many small utes, but heavy. That steering effort, despite its variable assist rack and pinion steering system, seems much heavier at slow speeds than it should. Plus in the tester there was a distinct groan from time to time at low speeds. Braking is good due to four-wheel anti-lock disc brakes and Stabilitrak, GM’s stability control system is standard. Past experience tells me the AWD version also is preferred if you spend much time trekking through snow. From a styling standpoint I prefer the smoother lines of its cousin, Chevy’s Equinox. Terrain gets squared fender bulges that remind of Chevy’s former HHR, which looks a bit dated. But inside the Terrain is one of GM’s best efforts for style and function, plus it’s pretty darned quiet. I like the soft touch dash and the SLT-2 had black leather seats with red stitching, plus some of the same on the main dash’s hood covering the gauges, and on the doors. There’s also brushed or satin metallic trim by the door hands, air vents, radio and steering wheel. Chrome trims around the shifter, but that reflects some on sunny days. Wish they would have stuck with the satin finish there too. Stepping into the Terrain is easy as it’s not an overly tall crossover or ute. This makes it attractive to drivers of all ages. Terrain still uses a keyed ignition, so no push button here, and a manual tilt-telescope steering column. 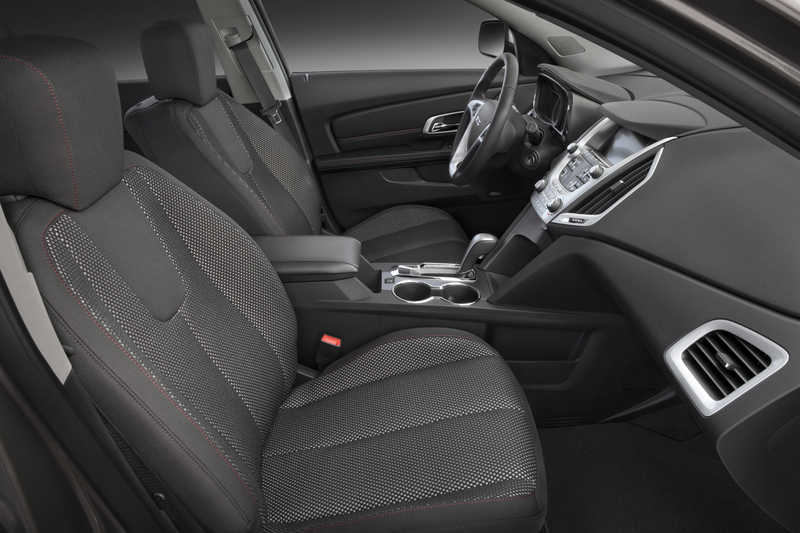 Three-speed heated seats are standard on this model, along with the leather seats. I drove this one roundtrip to Indianapolis and found the power seats comfortable and supportive and the power lumbar support is a benefit on longer trips. Standard too are goodies like OnStar, a rear-vision camera, fog lights and a nice radio with satellite service, a USB input and eight Pioneer stereo speakers. The navigation system with a 7-inch touch screen is part of a $795 stereo upgrade here. Included with this is a navigation system that shows you if interstate highways you’re traveling on are open (green), have some congestion (yellow) or are backed up or closed (red). It flat out works and helped direct me to the best path through Chicago. Now That is worth something! 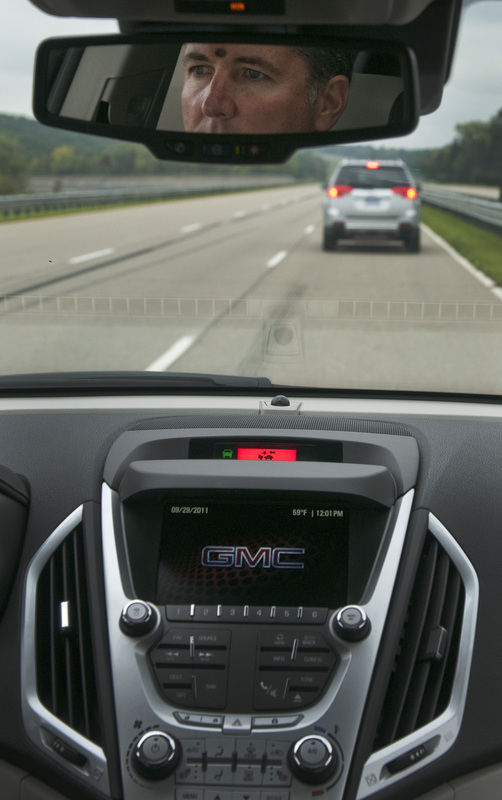 GMC’s first crash avoidance system displays at the top of the crossover vehicle’s center stack. Another feature on the tester was the $295 forward collision alert system coupled with a lane departure warning system. They certainly can make driving a bit safer, but can also become annoying in heavy traffic, such as around Chicago. You can turn them off in such a case, or the collision alert can be set on three distance settings to cut down on the amount of warnings you get. Finally, the Terrain V6 will drink E85 fuel, one that is higher in ethanol than what most vehicles have handled the last 10-15 years. It’s not always easy to find, but offers you another fuel choice. Be aware that the more ethanol in your fuel, the less power it delivers. Running on regular unleaded I got 25.3 mpg in strictly highway driving and 22.4 mpg in a couple runs that were about 75% highway miles The V-6 powered Terrain is rated 17 mpg city and 24 highway. Terrain and its Chevy cousin remain a solid choice for families looking for good hauling capability, reasonable pricing and decent fuel economy. Hits: Smooth power and shifts, easy step-in height and good cargo room. Comfy, stylish and quiet interior with sharp looking seats and trim. Model comes with rear-view camera and three-speed heated front seats. Will run on E85 fuel. Misses: Ride is choppy on sharp bumps and the ute feels heavy with heavy steering that groans at low speeds. HHR-like fenders make Terrain look dated compared to Chevy cousin, Equinox.